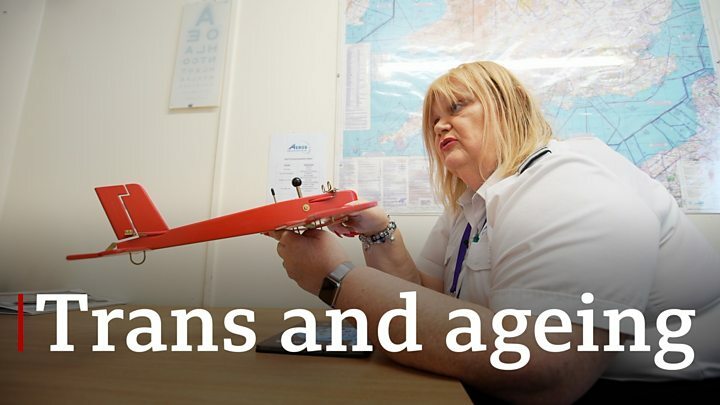 Media captionElderly transgender people "need specific help"
Captain Cat Burton always knew she wanted to be a pilot after her father took her in a jet fighter when she was just six months old. She also wanted to live her life as a woman but that dream took much longer to realise. Cat, who worked for British Airways for 45 years, said coming out as trans to her colleagues when she was 58 was the "hardest thing she's ever done". She is now calling for more training for doctors so that they are better able to deal with people who are transitioning, especially older people. Cat said she took four months off work, living permanently as a woman, before realising she could not go back as her "old self". "I liken it to stepping off a cliff in pitch darkness - and then finding out the cliff is only two inches high," she said. "The support I had from my colleagues was incredible. When I got back to work I was called in by my chief pilot, which is always a bit of a worry - he said he'd had a string of first officers in to talk about flying with me since I came back to work. "They all said how much easier I was to fly with now! I was a grumpy old so-and-so as a male captain - I used to sit on my side of the aeroplane and basically cut myself off, whereas now it's a case of you can't stop me talking." Do we need more than two genders? She said living two separate lives - as the "old her" in work and as Cat in her personal life was challenging. "It was daunting contemplating transitioning, I'd buried all my gender issues when I was 14," she said. "I'd locked them away in a little box in the back of my brain and I would never open this box but something opened it quite late in life - and I realised you only live once." Cat, from the Vale of Glamorgan, said that while she had a generally positive experience with her GP, the wait for services was frustrating. She said her GP managed her primary health care while she self-medicated with drugs she bought on the internet. Cat believes more doctors need to be trained in transgender issues - especially for those over the age of 50 - and that they should be able to prescribe the relevant hormones so people don't have to wait so long to transition. Research by The Trans Ageing and Care (Trac) project also says GPs need more training. A new report by the academics in Swansea and Bristol is the first of its kind in Wales. It looks at the unique issues that face people who are trans and over the age of 50. It says that responses from healthcare professionals to older trans people were mixed and that some GPs were even transphobic. Dr Christine Dobbs, from the Centre for Innovative Ageing at Swansea University, said that often trans patients had to give their GPs information, rather than the other way around. "We also had instances when there was very poor treatment of people who were mis-gendered, dead named using their old name, even front of house being called out to the appointment using the male name and there were lots of sources of prejudice even to the point of behavioural differences so I would say discrimination as well," said Dr Dobbs. Dr Nimish Shah, transgender lead for the BMA's General Practitioners Committee Wales, agreed there needed to be more trans awareness training and education for doctors as well as nurses, social care staff and society generally. He said up until now, doctors had to refer transgender patients to London, with long waiting times. But, he said they are waiting for a new gender team, based in Cardiff, with teams based in each individual health board, alongside an "enhanced service for general practitioners who wish to prescribe for trans patients who are going through hormonal changes". He added: "So, hopefully we're going to have a more local system and a system with shorter waiting times. I think it will also increase awareness of trans issues." Cat, now 66, says she worries about what it means for trans people when they age - especially if that means becoming incapable, living in a care home or with dementia. She said there were particular issues to consider for the ageing trans population such as facial hair growth or hair loss. There might also be issues with trans people with dementia, who might only have strong memories of their younger selves in another gender. "Somebody who's transgender and has gone past the ability to either afford or manage that situation is going to be in a care home and perhaps have no hair but they are still them," she said. "Are they going to be treated with dignity if they're going to be sitting there with male pattern baldness but identifying as female? Are they going to have to wear some grotty National Health acrylic wig? The dignity issues are enormous. We have specific needs which most care homes would not appreciate until they've got transgender patients in large numbers." The report makes five recommendations to improve services including training for health and social care professionals as well as agencies agreeing a benchmark statement on the level of care and support that trans and gender diverse individuals can expect.